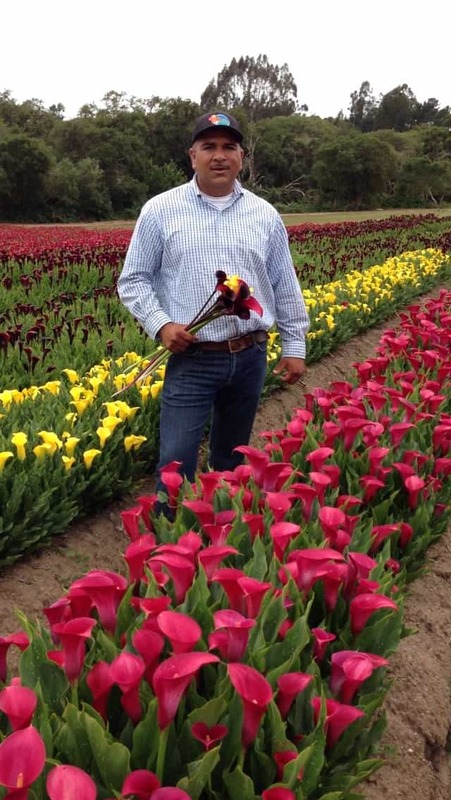 Rancho Espinoza is dedicated to providing high quality Coastal Calla bulbs to growers worldwide. We are committed to growing the most sought after varieties available. Our goal is providing our customers with the most vigorous multi-eyed calla bulbs in the market. In order to provide our growers with high quality calla bulbs we grow our callas in nutrient rich sandy loam soils in the Salinas Valley. We carefully select our fields to ensure we have the right growing conditions such as great water quality, disease free and pest free soils. We analyze our soils for various nutrients to ensure that our plants are given the right soil amendments allowing the best opportunity to flourish in their juvenile growing life. Our plants are carefully space to ensure they received proper light exposure and irrigation uniformity. This allows for the bulb to grow to its full potential. We monitor our fields daily for pest and disease, and apply the best pesticides commercially available in the market. Our quality standards are distinguished. We start off with our high quality seed. Rancho Espinoza grows their seed. The seed is tested for uniformity and germinated various times before it’s grown in the field. This process ensures that only the best and most vigorous seed batches are grown for our customers. Once are seedlings or Tissue Culture plantlets are growing in the field we are constantly monitoring for viruses. We have a zero tolerance virus management protocol in place. Our fields are clean from weeds and pest this establishes a healthier and more vigorous growing environment for our bulbs. We apply exclusive fertilizer blends that promote a healthier root system, while also protecting plants from soil borne and foliar diseases thus increasing total plant growth. When our bulbs are lifted they are carefully cured to promote a healthy healing process. Once bulbs are effectively cured they are inspected for cuts, disease, bulb physiology, structure, and dominance. After bulbs are inspected they are graded by size. Coastal Callas are then graded into 5 sizes for calla bulb distribution. They are as follow: 1”, 1.5”, 2”, 2.5” and 3”+. We want to simplify the density structure. We trained our Graders to grade on rounding to nearest smallest size. This method allows for our customers to actually receive a bigger bulb than they are actually paying for. Rancho Espinoza has a vision of simplifying the calla market. We only want to grow varieties that are proven winners. Desirable varieties are vital to making a profit. Growing Coastal Calla bulbs from Rancho Espinoza is giving you the opportunity to grow your profits.